Triple bill of superhero adventures based on the Marvel Comics character. 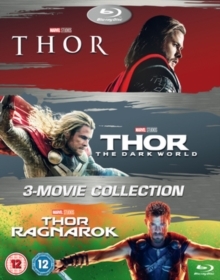 In 'Thor' (2011), moving between present day Earth and the fantastic realm of Asgard, the film tells the story of the Mighty Thor (Chris Hemsworth), a powerful but arrogant warrior god whose reckless actions rekindle an ancient feud among the deities. As a punishment, Thor is cast out of Asgard and forced to live on Earth among humankind. There, he falls in love with scientist Jane Foster (Natalie Portman) and, as the darkest forces of Asgard are sent to invade Earth, eventually learns what it means to be a real hero. In 'Thor: The Dark World' (2013), set after the events of 'Marvel Avengers Assemble' (2012), Earth and the Nine Realms come under attack from the powerful Malekith (Christopher Eccleston) and his age-old army that have existed since even before the creation of the universe. With the enemy proving near impossible to defeat, Thor approaches his adoptive brother Loki (Tom Hiddleston) for help, despite his villainous past. Meanwhile, the hero becomes reacquainted with Jane and takes her to Asgard in an attempt to protect her from harm. Finally, in 'Thor: Ragnarok' (2017), set after the events of 'Avengers: Age of Ultron' (2015), Thor finds himself imprisoned on the far side of the universe without the use of his famed hammer. With the villainous and ruthless goddess Hela (Cate Blanchett) looking to instigate Ragnarok, the destruction of Asgard and the entire Asgardian civilisation, Thor faces a race against time to return to his home world and stop Hela's evil scheme before it's too late.